As I mentioned yesterday, I am an avid reader and have a natural tendency toward life-long learning. These are 5 books on my reading list that will follow the 2 I am currently reading. I wanted to share them with a note about why I chose them. They are in no particular order, as it will be hard to decide which one to pick up next! No B.S. 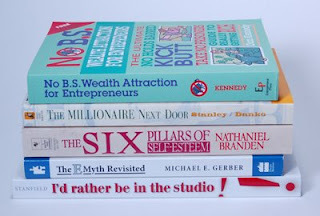 Wealth Attraction for Entrepreneurs by Dan Kennedy In the internet business and marketing course I'm taking, at the end of the first lesson, it said "buy this book right now and read it when you find time." So I did, and I will. The Millionaire Next Door by Thomas J. Stanley I was told this was a classic, and it would open my eyes in unexpected ways. The Six Pillars of Self- Esteem by Nathaniel Branden I read a tweet from @jeremyfrandsen would just finished this book. I could stand to flex my muscles in this area when it comes to my work. When someone winces at the price tag of my items at craft shows, I want it to have no effect on me. The E-Myth Revisited by Michael Gerber Tagline: Why most small businesses don't work and what to do about it. Another classic business book that has been recommended to me so many times I had to buy it. I'd Rather Be in the Studio by Alyson B. Stanfield I was browsing my usual art & craft blogs, when one link lead to another, and I came across this book. The title spoke to me, because I think a lot of us in crafty business feel this way. I will definitely write a review on this one. If there is a book you love that has motivated or inspired you, or changed your life in some way, please leave a comment about it! It will take me maybe 2 months to blaze through all of these books, and I will need more for my list. Thanks! I would recommend Art Festival Guide by Maria Arango. It's a very enjoyable read and full of useful information. Thanks for the recommendation, Amanda! And Congrats on your new bundle of joy!